By 1914 most young Australians had thoroughly learnt an adherence to war, race and glory, and to two nations separated by the world. They vaunted their sunlit land, and drew snowmen on Christmas cards. [...] They were ‘independent Australian Britons', defenders of the white race in the Pacific, volunteers to die in the defence of the ideals they had chosen. Gammage, B 2010, The broken years: Australian soldiers in the Great War, Melbourne University Publishing, Carlton, Vic. Over many years, the German Empire had built a navy capable of challenging the supremacy of the British Navy. Increasingly powerful in industry and manufacturing, they had also made an alliance with Austria-Hungary. What they did not have was Britain's network of colonies across the world. 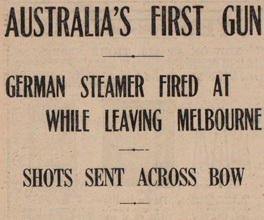 Melbourne Punch cited in: Gammage, B 2010, The broken years: Australian soldiers in the Great War, Melbourne University Publishing, Carlton, Vic. Although this quote originally appeared in Melbourne Punch, it was found in the source below. Good secondary sources are often a shortcut to great primary source quotes. In Melbourne, the day after King George's announcement that Britain was at war with Germany, huge crowds thronged the offices of The Argus waiting for a late edition of the newspaper. Later that night a group of three thousand young men rallied around a Union Jack flag chanting threats to ‘smash up' foreigners. Mounted police, fearing that German clubs and businesses would be attacked, moved to disperse the crowd. The rioters stabbed a police horse and smashed the windows of Chinese businesses on Russell Street. Newspaper accounts of the days following the announcement reflect excitement and enthusiasm. Unions made statements of support for the war effort. Companies pledged that employees volunteering for service would have their positions held and that they would be granted leave with full pay. Musicals in Melbourne ended with cast and audience singing Rule, Britannia and Advance Australia Fair. The correspondence of Anzac troops hints at tragedies kept to themselves; later revealed in diaries and memoirs.